DIARY: Getting into costume at a pioneer village and a mediaeval fair. Remember the old television show where the late Ernie Coombs used to dress up with clothes from the Tickle Trunk and chat with a couple of gormless puppets, Casey and Finnegan? It was aimed at little kids and I’m sure my three watched it when they were very young, but my acquaintance with the Mr Dress Up crowd came through a different route. In those days I was producing This is the Law, a popular quiz show, and we shared the old CBC Studio 4 (now a Staples store) on Yonge Street with Ernie and his crew. They went live or live-to-tape in the mornings and our sets moved in during the afternoon and we broadcast one live show and taped another before a studio audience in the evenings. During the change-over our paths would cross and my memory of Ernie was that he was as kind and lovable in person as he was on camera. When kids were on the set everyone was on best behaviour, but as soon as the coast was clear out would come the smokes. And turning the air even bluer was the puppeteer behind the boy and his dog. What a potty mouth she was, and funny too, especially when the words came out of the puppet’s mouth. Ernie played to that age old love of dressing up and at one time most of us have loved the opportunity to do the same for the simple reason that it allows one to become someone else for a while. Surely you’ve been to a fancy dress party as a pirate and practiced your Arrrghs on one and all? Or pranced around as a character from Shakespeare? Or strutted about as a Cardinal? Conrad Black famously once did and was the lovely Barbara a shepherdess or Marie Antoinette? I forget and anyway I wasn’t invited to that party thrown by the Westons at Fort Belvedere in Windsor Great Park. 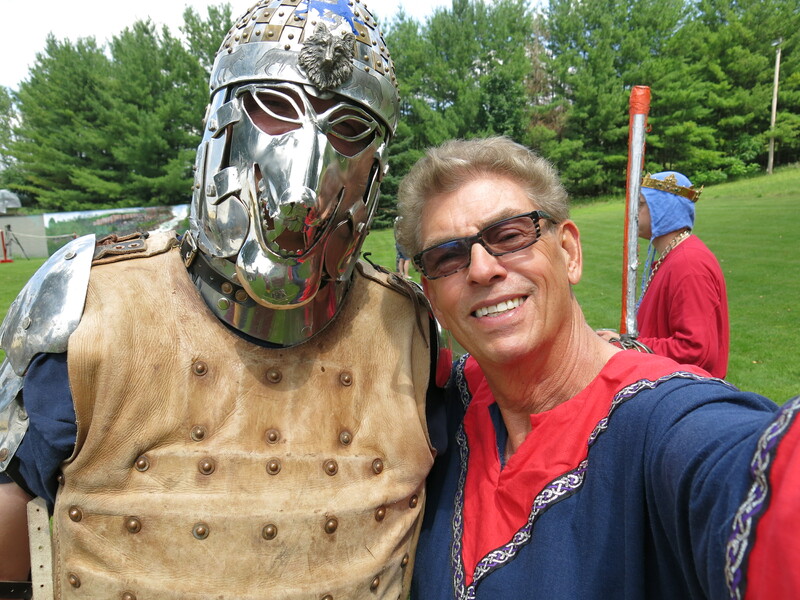 Recently, I’ve had a couple of opportunities to step out of character and into some interesting costumes, while taping my television series Escapes with Nigel. Somewhere in a wilderness of forest and fields north of Barrie, Ontario, the Society for Creative Anachronism was holding a fair and feast and we went with a crew to cover the event and have some fun. The SCA started in California nearly 50 years ago and has since branched out into 19 kingdoms around the world, where participants choose characters and dress up in utterly authentic costumes between about 600 AD and the end of the Elizabethan era. 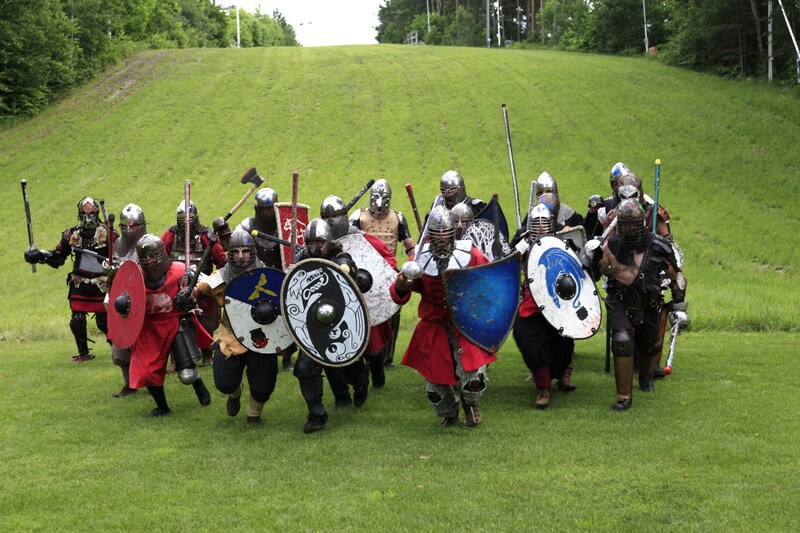 So they come, somewhat anachronistically, dressed as everything from Vikings to Tudor courtiers, with lots of knights in hefty armour in between. The organiser, who goes by the pseudonym Lord Conall, wear the garb of a fearsome warrior, with an amazing steel wolf’s head mask for protection during the heavy weapon fighting he enjoys. His lordship lent me a very fancy red and blue tunic with silver trim and a leather belt for the day and being a trouper I donned it for the taping. Nothing like prancing around in a dress all day, but it was stinking hot and I was probably the coolest one on the crew. I was pleased to be given the honorary title, Lord Nigel, but was somewhat deflated when I found out the default title for all newbies is Lord or Lady. Through effort and contribution, or fighting skills at various mediaeval sports, people rise to Baron, Knight or King. After a while, I got used to addressing people wearing crowns, or other badges of office, as if they really were nobility. We watched Lord Conall and his band of warriors, all heavily padded and armed, fight a series of set piece battles to defend an imaginary bridge. Wonderful stuff and I think it’s going to be great television. Having fought the good fight, he won the hand of the fair Lady Johanna and a colourful wedding ceremony took place. Actually it was his real wedding and the whole crowd came along to cheer him on. The only folk not in costume were some of his relatives, who didn’t dress up, and our crew. After the ceremony, I tried my hand at axe throwing. I was useless at it and quite humbled by the lady in a long dress and a wimple, who stuck her first throw right in the middle of the target. My first two axes went wild and the last one actually hit the target but refused to stick in. Through the magic of television, I’m sure my editor will ensure my performance on the show looks perfect. I was somewhat better at archery, which I tried next. The butts were set up away from the crowd so wildly shot arrows would spin off harmlessly. When I was practicing our crew was warned to stay well clear and having seen my performance at axe throwing, they did just that. The man in charge was a distinguished character with the rank of Baron. Seeing I was properly tugging my forelock, he kindly offered to lend me his personal bow. I couldn’t even pull the bow string back far enough to shoot an arrow. A bow less hard to pull was brought, one for girls I think, and I managed with that. Later he told me that his bow had a draw of 36 pounds, the one I used was 20 pounds and the famous English bowmen who beat the French at Agincourt drew over 100 pounds. The Baron also lent me his personal arrows and under his stern instruction all my shots hit the target. A much better performance. A few days later we were at the Pickering Museum Village, a collection of authentic pioneer buildings saved from destruction and gathered in one spot, with demonstrations of life in the 1850s and period crafts for children. Staff wardrobe chief Julie Oakes took one look at me and decided I should be costumed as a gentleman. This outfit took more effort putting on than the simple mediaeval tunic, but the effect was authentic. Another stinking hot day for the shoot and this time I was the one steaming in a thick shirt, embroidered waistcoat and felt tailcoat. Top hat, gloves and a fine walking stick completed the outfit. In full Victoria gentleman character I chatted with the ladies in the village, tipping my hat to all, guided around by the charming and knowledgeable Katrina Pyke. 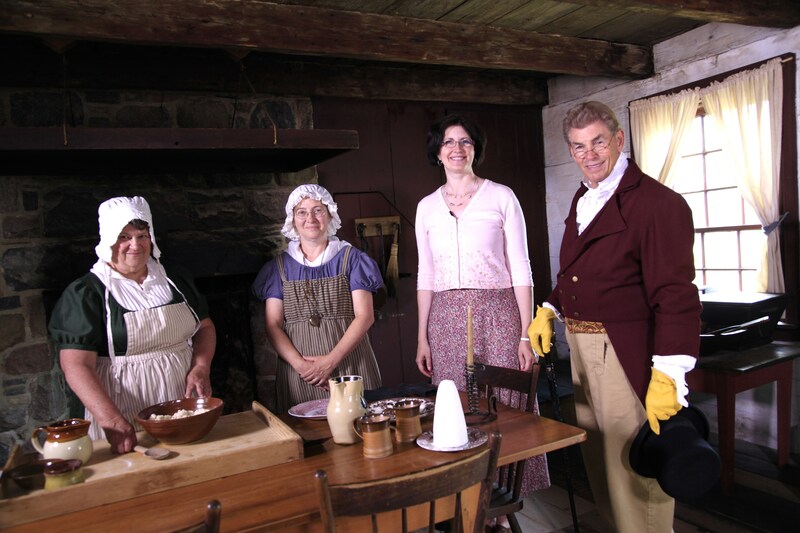 The ladies, and a few young men too, some volunteers and some staff or summer students, get to dress up for work every day and make a tour of the village a fun experience for visitors. The best part of my day was getting to drive Princess, the steam traction engine. Joe the engineer handled all the complicated controls and I merely steered, but we didn’t run into anything and I can tell you it was quite an effort on a giant machine designed in the days before power steering. Dressing up and driving a steam engine. Perfect for the inner boy. UPDATE: The Society for Creative Anachronism show will be broadcast on Bell Fibe TV, channel 1217, from Sunday, November 2, and the Pickering show will be broadcast from Sunday, November 23, 2014. Both are available immediately on our Escapes with Nigel website.